Jamel Turner, driver in crash that killed 5, finally accepts plea deal for 27 years | Timothy Sini for D.A. 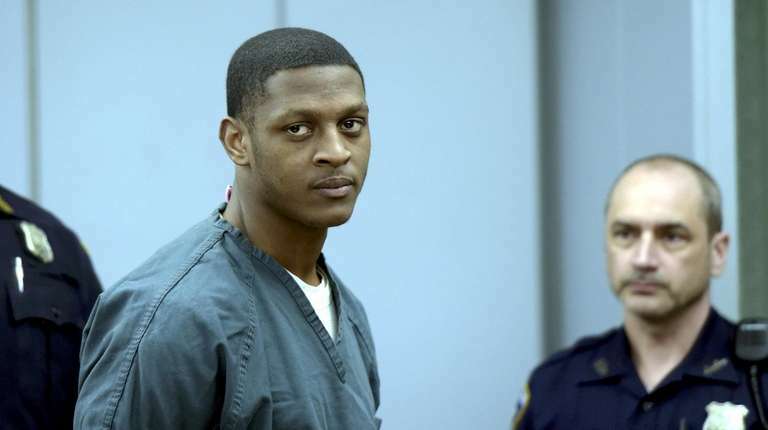 Twice on Wednesday, a Bellport man charged with killing five people while fleeing from police in a stolen car rejected plea offers before finally pleading guilty in a deal that will put him behind bars for 27 years. Jamel Turner, 25, had spent the previous night considering an offer of 30 years before rejecting it the first time he appeared in a Central Islip courtroom Wednesday. But within an hour, he agreed to accept to a modified version of the offer that brought the sentence down to 27 years. He got most of the way through the plea process, glumly answering questions by state State Supreme Court Justice Fernando Camacho, when his head sagged and he spoke quietly to his attorney, Scott Gross of Garden City. Gross then addressed the judge. “I’m sorry, we don’t have a disposition anymore,” Gross said, and he and equally grim-faced prosecutors left the Central Islip courtroom. But after lunch, Gross told Camacho that his client had once again reconsidered and was willing to take the 27 years. “Are you sure?” Camacho asked. Turner said it was, but then he balked one more time when prosecutors insisted he waive his right to appeal. Camacho told Turner then it was up to him whether to go forward. Turner finally waived his right to appeal and the plea was done. Turner had been charged with five counts of second-degree murder and faced 50 years to life for the deaths of his friend Lonidell Skinner, 19, of Bellport, and four people in a car he hit at high speed on Feb. 14, 2018 — Jacquelyn McCoy, 55, her daughter Mary Alice Booker, 36, and son Anthony McCoy, 33, and his girlfriend, Tameka Foster, 42. Gross said his client avoided spending his entire life in prison. He ultimately pleaded guilty to five counts of first-degree assault and five counts of aggravated vehicular homicide for each of those killed, another count of first-degree assault for another motorist whose spine was broken in the crash, driving while ability impaired by marijuana, and cocaine possession from a separate incident. With that, Turner said he didn’t want the offer and Assistant District Attorney Brendan Ahern began outlining some of the evidence he would seek to introduce at the trial, which would have begun next week. Ahern said he wanted to present evidence of Turner’s drug dealing because that is the reason he said Turner had associates rent the 2018 Chevrolet Camaro SS, why he failed to return it even after it was reported stolen, and why he fled from police that day. Turner initially got his associates to rent him a Chrysler 300 in return for drugs, but requested the Camaro after he decided the 300 wasn’t fast enough in case he needed “to get busy on the boys,” his term for running from police, Ahern said. Turner couldn’t rent cars himself because his license had been revoked for years, Ahern said. Ahern said the same mobile phone number that was paired to the Camaro that day was used in Turner’s various drug sales. Crack packaged for sale was found in the wreckage of the Camaro after the crash, Ahern said. After the Camaro wasn’t returned to the rental company, Ahern said the company reported it stolen. The car’s OnStar system allowed police to track it, and they set up a blockade to stop Turner that day, Ahern said. But Turner drove off the road around the blockade and took to Middle Country road in the Ridge area, going as fast as 154 mph down the center turning lane, scattering motorists on both sides of the road, Ahern said. “Witnesses are going to describe him driving like a torpedo,” Ahern said. As he spoke, some friends and family of Turner’s were removed from the courtroom for causing a minor disruption. When Turner ran into the back of a Mazda, Skinner and Turner’s Pomeranian, Prince, were ejected from the Camaro when the passenger door was ripped off. All four people in the Mazda burned to death. Jacquelyn McCoy lived in Calverton. Her daughter, son and Foster lived in Ridge. Camacho will sentence Turner on May 7.